Traditional and original songs rooted in the Celtic lands, Quebec and America. Rich and expressive voices are complimented by driving rhythms on the guitar and bouzouki and by beautiful melodies played on the Irish flute, mandolin, and fiddle. 12. Ah! Si Mon Moine Voulait Danser! 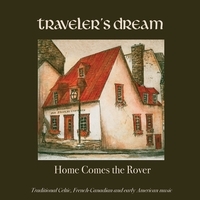 Home Comes the Rover, the third CD by Traveler’s Dream, is exceptional for its creative mixing of traditional and contemporary musical styles as well as for the sterling vocal and instrumental performances by band members Michael Lewis and Denise Wilson. The duo’s voices, individually and in harmony, are the bedrock of Traveler’s Dream’s sound, but the delightful quality of this music is also due to the changing combinations of traditional instruments which create textured melodies and shifting moods. The clear and bright tones of the fiddle, concertina and mandolin create a fresh counterpoint to the deep and haunting sound of the Irish flute. Michael Lewis’ delicate finger-picking on “Mary and the Soldier” and “The King’s Daughter” stands in contrast to his driving strumming style on “Holy Ground.” The soothing interplay of the Irish flute and mandolin on “Planxty Hewlett” and “Ash Grove” gives way to the rousing refrains of “Ah Si Mon Moine Voulait Danser” –an old voyageur song that comes to life here with the distinctive sounds of the jaw harp, Quebecois-style “dancing” feet, and powerful fiddling of guest musician Deb Shebish. In the year 2000 Lewis and Wilson set their personal and musical lives on a common path when they began performing as Traveler’s Dream. Since then they have captured the hearts of audiences young and old with their vibrant mix of traditional and original songs, hard-driving Irish jigs and reels, rousing sea chanteys, French-Canadian chansons, and timeless original compositions. The band’s broad appeal owes much to the duo’s impressive skills as multi-instrumentalists, the beauty of their close vocal harmonies, and their dynamic ability to engage audiences with their warmth, humor, and wit. Raised in the heart of the Midwest, Lewis and Wilson feel a deep attachment to the landscape and history of the place they call home. They have a keen sense of their dual roles as inheritors and purveyors of traditional music – particularly the songs and tunes from France and the British Isles which comprised such a large part of the early music of the Midwest. Though they draw deeply from this rich wellspring of traditional material, the members of Traveler’s Dream are actively engaged in the contemporary folk process of creating vibrant arrangements of old songs and writing imaginative tunes and songs of their own. Listeners are often captivated by Michael’s resonant, powerful voice and his innovative guitar, bouzouki, and mandolin playing. Though his technical skill is impressive, it is the art and emotion in his singing and playing that set him apart from others. Using a variety of chord voicings, delicate finger-picking, and percussive strumming techniques, Michael is a master at choosing just the right instrument and style to enhance the mood of each song. His skills as a musical composer, songwriter, and arranger give Traveler’s Dream a sound and style that are uniquely its own. With a poet’s ability to capture what is universal and enduring in human experience, Michael’s songwriting talents were recently recognized by the Indiana Arts Commission who awarded him a grant to research regional traditional music and write four original songs relating to midwestern culture and history. When not on the road performing, Lewis enjoys producing and recording the music of other regional musicians at his recording studio, Middle Earth. Michael is currently at work on his first solo recording of his original songs, which will be released in 2011. Denise is a musical jack-of-all-trades whose music has been strongly influenced by her family’s Celtic roots, her love of history, and her life-long interest in French language and culture. She contributes to the textured sound of Traveler’s Dream with her exuberant voice, Irish flute and whistles, fife and the concertina. Denise’s first professional musical experience came during her college years when she sang with a French dance band while studying in Strasbourg, France. After returning to the U.S., Denise earned a solid reputation as a singer and first-rate entertainer with the band Bon Jolais. She toured with that group for the next fifteen years, solidly establishing herself as one of the region’s finest interpreters of traditional music. With a B.S. in French and a Ph.D. in American History, Denise has a broad knowledge of the culture and history surrounding the music she plays. Traveler’s Dream has made a point of preserving the music of these early settlers. Black Cavalry shows a strong Irish influence, including the wonderful interplay between the guitar and bouzouki. But I think of the concertina as an English instrument. So the song probably reflects the intermixing of cultures that would lead to the development of a uniquely American sound in time. In any case, this performance of Black Cavalry is no museum piece. Traveler’s Dream bring the song fully to life with their energy and talent. I should also note that Denise Wilson has a wonderful singing voice, which is put to good use elsewhere on this album. Home Comes the Rover is a fine mix of songs and dances, brought to life with high spirits and quality playing and singing. For more, see my full post at http://oliverdiplace.blogspot.com/2011/07/american-heritage.html.